Athens Lower Village Historic District was added to the National Registry in 1980 (District #80002616) This district is roughly bounded by Hudson River, NY 385, Vernon and Market Streets. 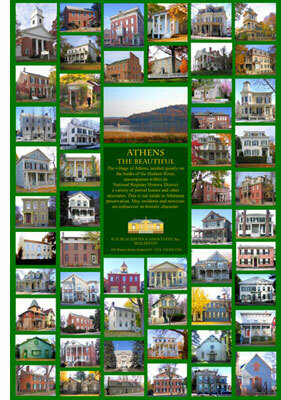 It features homes and buildings in the Federal, Greek Revival and Late Victorian architectural styles. The period of significance is from 1800-1899. Athens Brick Row Historic District was added to the National Registry in 1980 (District #80002617) This district was originally built by the Saratoga & Hudson River Railroad and is located off NY 385. It features homes in the Greek Revival architectural style. The period of significance is from 1850-1874.